I DID Write a Book! It is finished! Just a few short days ago I clicked send on an email submitting my manuscript to my editor. 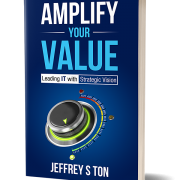 “Amplify Your Value – Leading IT with Strategic Vision” will be published in a few short weeks. Using stories from my time as a Chief Information Officer for Lauth Property Group and Goodwill Industries of Central Indiana, the book lays out a framework for creating a vision, defining strategies to achieve that vision, and executing on those strategies. As Will Lasalle said in his foreword for the book, it comes complete with the cheesy IT humor you’ve come to expect from me! You can read more about the book at Amplify Your Value. This is a moment I have been dreaming about for years. In fact, I have started and stopped writing a book about as many times as a smoker starts and stops smoking. What was it that enabled me to break through and actually finish a book? Is there some sort of “patch” for writers? That day I downloaded the audio book, “You MUST Write a Book” by Honorée Corder. I listened to it on my daily commute. In fact, I think I listened to it three or four times. I was so energized! I ended up buying a paperback copy as well so I could refer back to it easily. One of the things she talks about in the book, is to find a topic you are passionate about, perhaps one that you have spoken about. I decided on Amplify Your Value. I have spoken to numerous audiences, telling the story of the tremendous accomplishments we achieved during my five year tenure at Goodwill. I even had a series of blog posts I had written for Intel on the subject. I began to write! Since early November I have been getting up at the ungodly hour of 5:15 every day (well, ALMOST everyday) to write. The house is quiet, the coffee is hot, and the daily deluge of email has not yet started. For Christmas, my wife Carmen, gave me another book by Honorée, “I MUST Write MY Book”. This book is a workbook that follows along with the text from “You MUST Write a Book”. As you complete the exercises in the workbook, you build a plan to develop, write, publish and market a book. Go figure, a career IT geek needed STRUCTURE and a PROCESS to successfully complete a manuscript. Drawing on my past experience as a hip-hop record mogul (you remember Brad Real and 8729 Records, right?) and Honorée’s approach, I have chosen to take the indie publishing route. Carmen and I have formed a publishing company, I’ve hired a freelance editor, proofreader, and copywriter. I even used crowdsourcing for the cover design. The book is not yet available for pre-order, however, you can follow along on the journey by subscribing to my newsletter. I promise not to spam your inbox, but if you want the latest on the book, my blog posts, or my speaking appearance, sign up for Jeff Ton – News today! Facebook, Twitter and LinkedIn are constantly updating their algorithms, don’t miss a blog post or an update. Sign up for Jeff Ton – News today! https://jeffreyston.com/jst/wp-content/uploads/2018/05/cover-icon.jpg 500 500 Jeffrey Ton /jst/wp-content/uploads/2019/01/Jeffery_S_Ton_340x156_darkblue.png Jeffrey Ton2018-05-25 05:33:192019-02-15 17:22:36I DID Write a Book! Amplify Your Value - Available Now! Amplify Your Value - Publication Date Set! I am excited about reading the book. Congratulations Jeff! I can’t wait to read it!